This TechTALK introduces Actian's new cloud data warehouse service. Attend to learn more about the fastest analytical database technology as a managed service with multi-cloud deployment flexibility with support for AWS and Azure. Actian DataFlow eliminates performance bottlenecks in your data-intensive applications by delivering a comprehensive set of ETL and data quality capabilities for end-to-end data access, transformation, preparation, and predictive analysis. It complements Actian Vector with a graphical interface to manage data workflows, orchestrating analytic functions and maximizing parallel work streams for faster execution. Join us to learn how DataFlow can transform your data into knowledge and create competitive advantages for your organization. In this Summit presentation, Emma McGrattan introduces the concept of an Operational Data Warehouse (ODW) as a means to provide the freshest view of the business. 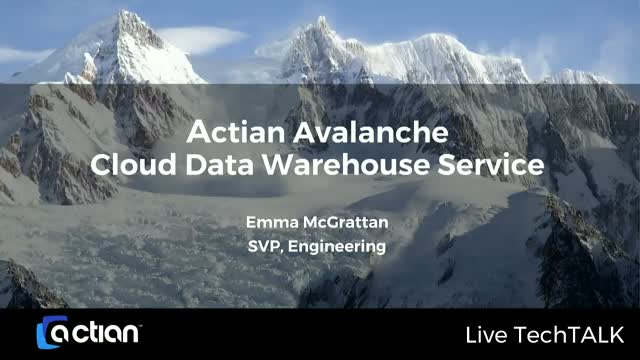 Emma will then share use cases and illustrate the applicability of Actian’s Avalanche Cloud Data Warehouse service to as an underpinning for an operational data warehouse. Empowering mobile workers, harnessing the power of IoT, or any other hot topic under the umbrella of digital transformation are all part of a general goal providing better business solutions. In all these cases, the lynchpin to success is incremental yet continuous improvement to the underlying data management, integration, and analytics platforms. Join this webinar to hear about several key advancements in modern hybrid data platforms, addressing a broad and diverse set of business challenges. How to provision an Actian Avalanche cluster. How to connect Power BI to Actian Avalanche. Getting you up and running with Actian Avalanche. How to connect Qlik Sense Desktop to an Actian Avalanche cluster. How to connect Looker to Actian Avalanche. Demonstration of connecting the DBeaver SQL client to an Actian Avalanche cluster using JBDC connectivity. How to install and configure the Actian Avalanche Client Runtime software in a Windows environment in 3 simple steps. Learn about Actian's ground-breaking hybrid data solutions that enable digital transformation with global scale and reach. In today’s digital world, businesses must rapidly disrupt, integrate and adapt to changing business requirements with greater agility to improve customer loyalty and create sustainable competitive advantage. They need an agile integration platform that will accelerate their Digital Transformation initiatives. In this presentation, Henry Peyret, Forrester analyst and our guest speaker will share his views on Integration Market trends and the requirements for Dynamic Integration Platforms. This video contains highlights from Rohit De Souza's interview with The CUB. Rohit shares his views on digital strategies, the convergence to hybrid data and the data management value chain. Rick discusses the challenges and successes of Equian's digital transformation journey over the last two years. Equian has grown its healthcare insurance business 26% over the past year, with technology improvements that have improved their service quality, time and competitiveness. This TechTALK introduces the Operational Data Warehouse (ODW). Pradeep Bhanot will introduce the ODW and the Actian Vector analytics database. Emma McGrattan, SVP Engineering will provide an overview of key database technology that enable the ODW uses. Pradeep will close with a demonstration of the Windows edition. Viewers can ask questions during the event to be addressed during the live Q & A or by email following the event. Businesses must operate in the moment to maintain their competitive advantage. To do this they need fresh operational insights. In this presentation Mike Gualtieri, our guest speaker will share his views on the requirements for next-generation data warehouses. Pradeep Bhanot will describe how an Operational Data Warehouse (ODW) can deliver fresh analytics. Pradeep’s focus at Actian is on analytic database solutions. Pradeep has worked with databases since 1984, starting with IBM VSAM, SQL/DS and DB2. Over 13 years at Oracle Pradeep held several technical and business roles. Since 2002 Pradeep has been working with Microsoft SQL Server and Actian’s Vector columnar, in-memory analytic database. Actian powers today's hybrid data enterprise by providing innovative data management, integration, and analytics solutions.